Go Green, Save Green divulges hundreds of practical, easy-to-implement steps that you can take to create substantial money savings while protecting the earth. Nancy Sleeth and her family have been living an eco-friendly lifestyle for years saving both time and money. Sleeth also demonstrates how going green helps people live more God-centered lives by becoming better stewards of financial and natural resources. Chapter titles include: (1) Home; (2) Lawn and Garden; (3) Work; (4) Transportation; (5) Food; (6) Sabbath; (7) Holidays; (8) Entertainment; (9) School; (10) Church; (11) Nature; and (12) Community. 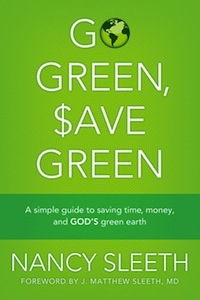 Hundreds of simple, easy-to-implement money-saving tips for going green at home and at the office. Simple cost-saving formulas that allow readers to calculate their energy/financial savings as they go green. Helpful “try this instead of that” charts offering money-saving green solutions for everyday living. Quote: “Dear heavenly Father, Creator, and Sustainer, give me the knowledge and will to honor you by using resources wisely in my home. Help me to preserve rather than to destroy; teach me to conserve rather than waste. Remind me that everything I possess is on loan from you. Help me to create a God-centered home that I share freely with others. Strengthen my desire to become a better steward of your abundant blessings.” (p. 56). Summary: Sleeth writes about their family adventures in gardening and creation-love, giving many practical tips on gardening and landscaping. Growing a personal crop of indigenous fruit and vegetables, composting, and planting and protecting trees are a few strong suggestions. It’s a really beautiful (and incredibly practical) chapter about honoring the Creator’s masterpiece that we call home. Summary: Sleeth shares about her efforts to reduce the ecological footprint of her employment—only after they had done the same in their own home. She emphasizes that the little things do make a huge impact overall—from office supplies, computer energy consumptions, paper and ink usage, coffee, commute, and wardrobe. Summary: Sleeth shares about the family’s efforts to “save gas, save money, save lives” through careful use of transportation. She chimes in on everything from distance of vacation destinations to the everyday transportation to and from work and errands: biking, carpooling, being mindful of time spent traveling and time actually spent together as a family. Summary: This chapter was all about how to save money on food. Nancy emphasizes buying local and in bulk. Also, that we should be mindful of little ways we can reduce energy costs cooking at home. Summary: Chapter 6 focuses on the importance of the Sabbath. Nancy emphasizes the importance of taking a rest from the busyness of culture by resting one day and putting all other work aside. Summary: The key to this chapter is simplicity and having a low impact on the environment. For every holiday there are ways to simplify things and reduce how much is being spent. Summary: In this chapter Nancy encourages readers to look for alternative sources of entertainment and to cut out the amount of time spent on TV. She also emphasizes simplicity in entertainment and suggests finding activities to do outside or even just fun board games. Summary: Nancy Sleeth shares about her experiences in the classroom and how to incorporate environmental projects into everyday life as well as classroom lessons. Sleeth teaches and encourages parents to become stewards of God’s creation by “going green” in their child’s everyday school routine. Summary: In chapter 10, Sleeth really encourages the church as a whole to be stewards of God’s creation. God gave us the earth to enjoy but also to take care of. What better place to start being more conservative in energy and more earth friendly things than the church? Simple things just like changing light bulbs, purchasing more organic coffee for fellowship, or even carpooling to church help cut costs. Summary: Chapter 11 focuses on community and how we can make a difference even in our own neighborhood. Jesus called us to love our neighbors which most of the time is in our comfort zone; however, he also called us to love our enemies and to step outside our comfort zone. Jesus may call you to simply have your neighbor over for dinner, or he may call you to your local homeless shelter, which seems a little further outside what most people are comfortable with. Things such as these are helping impact our world and our environment!